Sealed pattern for a Norfolk Regiment officer's mess waistcoat, 1911. 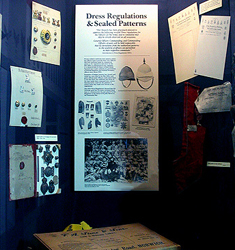 Sealed Patterns are examples of approved badges, buttons, cloth and styles. They were kept by the War Office as standards to be adhered to in uniform and were referred to by manufacturers and officers.